Backgammon is a board game that involved two players trying to move their 15 checkers across the backgammon board, according to the roll of two dice. The objective of backgammon is to remove all 15 checkers from the board before your opponent does. This is done by first getting all of the checkers into your home board, and then removing all of your checkers according to the dice score. This stage of taking your checkers off of the board is called the bear-off. The winner of the game, according to backgammon rules, is the player that succeeds in bearing off all of his checkers first. · There are 30 checkers used in backgammon, 15 black and 15 white checkers. The checkers are moved across the backgammon board until they reach the bottom right side of the board, called the home-board. 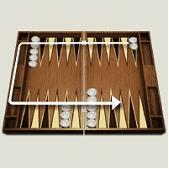 · The backgammon board includes 24 points. These are the 24 triangles on which the checkers are moved on the backgammon board. The backgammon points are numbered between 1 and 24. The bottom right of the board is numbered 1. For your opponent however, this is his 24-point. · The player's home board is in the bottom right corner quarter of his board. The upper right side of the board is called the outer board. During the game, players move their checkers from point to point, until they reach their home-board and can take the checkers off of the board. · There are two dice used in the game. Each dice has 6 sides and is numbered from 1 to 6. The roll of the dice determines the movement of the checkers across the board points. To start the game off, the starting player is decided. In order to decide which player begins first, each of the players throws one of the two dice. The player who rolls the higher number initiates the game. If both players roll the same number, they will throw the dice again till the numbers differ. The backgammon player that starts the game uses the number shown on the dice to move his checker a related number of points. A player can either use both dice to transfer one backgammon checker across the board, or divide the dice score to two separate checker movements. After his first movement, it is the other player's turn as he throws the dice and moves. The player that starts the game moves according to the number of the dice score. When the first move is completed, the second player throws the dice again, and moves in the same manner as the first player. · If a player rolls the same number on both dice (a double), he plays that number four separate times with any checker he wishes. · A player must play-out both of the dice scores, and move his checkers accordingly. If only one of the dice numbers can be played, then the player only moves according to the number he can. If none of the numbers are a possibility, then the turn moves to the other player. · A checker can not move to a point that has more than one of the opponent's checkers. If your dice score is 5 3 for example, you can either move one checker 8 points ahead, or move one checker 3 points, and move another checker 5 point. A blot is a point that is occupied by only one checker. You can hit your opponent's checker by landing on a blot. When this occurs, and you hit your opponent's checker, His checker is moved outside of the board and into the bar. In order to move the checker off the bar a player needs to move it to an open slot in the opponent's home. If this is impossible the player forfeits his turn. If one or more checkers are on the bar, the player cannot move any other checkers until he brings his checkers back into the board from the bar. When a player re-enters the board, he does it from the outer board, meaning from the 24-point. Entering the board from the bar is enabled only if the dice score for the player corresponds to the open points on the outer board. If a player gets a double 3 for example, and the 3-point is occupied by two of the opponent's checkers, then the player cannot enter from the bar and the turn passes to the other player. The Bear off happens when all of the checkers are inside a player's home-board. This is the stage when a player starts to take checkers out of the borad. Bearing off is made with similar backgammon rules as the rest of the game. The player throws the dice and removes checkers from corresponding points, or pips, in his home-board. Thus, if a player has rolled the number 3 and 6 he will be able to remove the checker on the sixth point and on the third point. When the dice score shows a number that is not occupied by a checker, the player can advance his checkers forward. For example, if the player rolls 4 and 2, and the 4 point is empty, he can advance his 6 or 5-point forward by 4 points. If that player doesn't have any checkers on the 5 and 6 points, then he can remove checkers on lower points. This way he can remove a checker that is sitting on the 3-point with the score of 4. If a player had begun removing checkers and one of his checkers was hit by the opponent, he must enter the board on the opposing home and can not bear off any pieces until the checker is back at his home. Although removing checkers is not mandatory and player can move checkers inside his home instead, there are several moves which are required. If the number rolled on the dice is higher than any occupied point the player must remove the point from the closest point. If a player rolls a number smaller than any occupied point and has no checkers that can be removed, he must move a checker from a higher point according to the dice. The first option to raise the number of points you win in the game is to use the doubling cube. As mentioned before, this is the cube that is used to raise the stakes. These stakes can be raise by up to 64 times the initial wager. Another way to win more points is through winning gammon and backgammon games. This is when you manage to bear off when your opponent is still lagging behind. A gammon is when your opponent hadn't borne off any of his checkers, and this win earns the winner two times the doubling cube. A backgammon is when the opponent still has a checker on the bar or in the home-board when the other player wins. This win earns the winner with three times the doubling cube.